A bit old but a good read anyway! 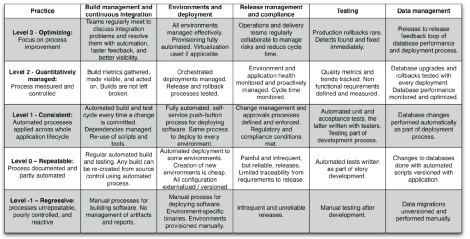 The Maturity Model is a useful assessment tool for understanding your organizations level of Continuous Delivery adoption. Many organizations today have achieved what is needed to move from Level-1 (Regressive) to Level-0 (Repeatable), which is a significant accomplishment and as a reader of this blog post, you’re either about to start your journey of improvement or are already underway. The advice for organizations wanting to adopt Continuous Delivery is ever more abundant, but for organizations that started adoption some time ago, the guidance on how to mature the process is still sparse. In this article, we explore one continuous improvement methodology that may help your organization mature its’ Continuous Delivery process.